On a century-old family farm just outside of Chestertown, there’s something new growing.TUCKED BEHIND THE HAY BARN, THE milk house, and the utility sheds on Bryan Williams’ Red Acres Farm, two high tunnels gleam in the early spring sunshine. Inside, rows of lettuces in various stages of maturity flex their green muscles, unhindered by cold or drought, untreated with pesticides, and untouched by fossil-fueled equipment. This is hydroponics, a high-tech growing process whereby crops are grown in rock wool embedded in plastic trays, fed by water and nutrients in climate-controlled greenhouses. While the computer panel at the rear of the growing facility controls the temperature, carbon dioxide levels, and humidity, the human touch is very much in evidence in the sowing, harvesting, marketing, and distribution of the year-round crop.Joseph Bauer, a lecturer in business management at Washington College who helped develop the business plan for Red Acres Hydroponics (his daughter, high school science teacher Liza Goetz, introduced the concept to Bryan and Tracey Williams), thinks this new enterprise could be the start of something big for Kent County. 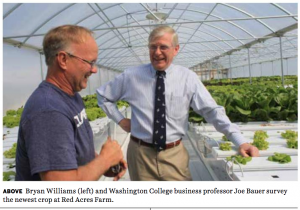 Red Acres could become the model for other entrepreneurs and work as a business incubator that helps other agricultural start-up companies get off the ground.”Kent County is the smallest county in Maryland, but the largest from an agricultural standpoint,” Bauer says. When we talk about economic development for our county, we shouldn’t try to become something we’re not. We do a very good job of being ourselves–people who care about preserving our agricultural heritage, but who also want to add value to their farm properties.”When Bryan Williams’ father was working the farm, he was raising dairy cows. Before his death, the elder Williams encouraged his son to move into grain production. Deer corn and hay have been Williams’ crops of choice until last winter, when two chance encounters–one in a high school classroom where Goetz had a small hydroponics system on display, and another at a Farm Bureau dinner, where hydroponics was mentioned as “the next big thing in farming”–convinced Williams to go all in. While Red Acres is expanding its circle of wholesale distribution to restaurants and food brokerage companies, Williams has converted the milk house into a tiny storefront where neighbors can stop in and pick up their orders. Along with the eight varieties of lettuces available, spinach, kale, English spring peas, and herbs will soon be on the menu. Red Acres also has a presence at the Chestertown Farmers Market. 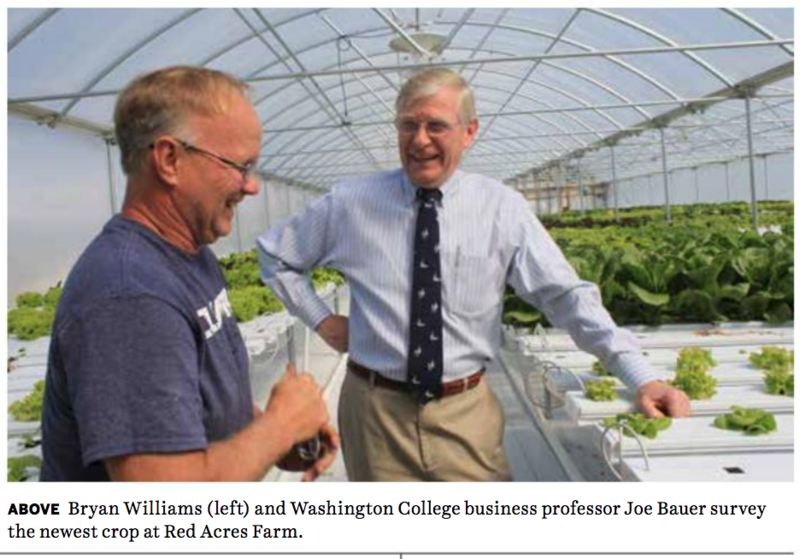 As is all farming, it’s hard work, but Williams seems to relish the challenge of growing a new business–for the future of his family and for Kent County.